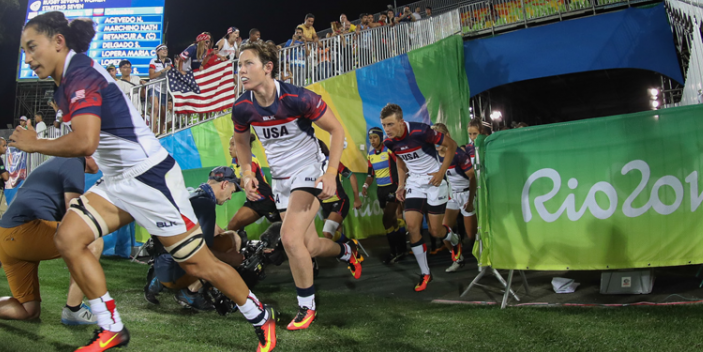 Jillion Potter’s path to the 2016 Olympics in Rio de Janeiro started when she took her first step onto UNM’s Johnson Field with the University of New Mexico Women’s Rugby team in 2005. Her first semester at UNM Potter was recruited three times by different people to try out for the team. She turned them down the first two times. Potter was attracted to rugby not only because of the physical nature of the game, but also the community of teammates and supporters she discovered after joining the team. As an accomplished athlete, Potter turned out to be a natural. So much so that only three months after she started, she was invited to try out for the United States Under-19 National team. Potter impressed the coaching staff with her physical skill and aggression so much that she was quickly added to the team, and two years later she earned a spot on the U.S. National Women’s Rugby team. Potter has played in 22 games for Team USA so far. But Potter’s rugby future was put in jeopardy in 2010, when during a game against Canada, two players accidentally fell on her. While the Canadians got back up and into the game, Potter stayed on the ground, knowing something had happened. Potter was escorted off of the field and spent the rest of the game on the sidelines. She returned to the U.S. where she found out the extent of the damage to her neck. She was taken to the hospital, where her worst fear was realized. She had fractured her C5 vertebra, ruptured a disc and torn several ligaments in her neck. She was rushed into surgery and was told she would never play rugby again. While Potter started recovering from surgery, her teammates were headed to England to compete in the Women’s Rugby World Cup. She knew that it would be hard to watch them on the field, that she should be out there on the field with them. So Potter cheered on her teammates, and with each passing day she was more confident that she would eventually return to the field. After the World Cup ended, Potter planned her own return to rugby. She had found a doctor who believed she would be able to rehabilitate her neck injury and would eventually play again. Potter returned to Albuquerque, to spend time on the field where she had first fallen in love with the game. She returned to help her former teammates prepare for their rugby trials, while she prepared to face her own. Potter was told she would have to wait at least a year until her body was ready to return to the rugby pitch. But after six months, she was taking part in the same full-contact drills she was teaching her teammates. 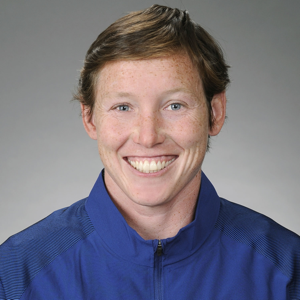 After a year of coaching at UNM, Potter moved to Glendale, Colo., where she returned to the playing field with the Glendale Raptors. “I remember I was nervous in the tackles and making contact with players. But after I made my first big hit, I was fine. It was like riding a bike, you fall down and get back up. It’s something that you’ve done so many times, get tackled and get back up. As she became reacquainted with the game she loved, Potter received another surprise. She was offered a contract to move to San Diego and start training at the U.S. Olympic Training Center to prepare for the 2016 Olympics in Rio de Janeiro. Now that the Olympics are over, Potter is preparing for the next act of her life. With another Women’s Rugby World Cup looming, Potter is stepping away from playing for the U.S. national team, and spending more time with her wife, and their two puppies, while she finishes her MBA and explores life beyond the rugby pitch. But from time to time she reflects on her experiences and the game that has been such a big part of her life for over a decade.